IWSG August: What are your pet peeves when reading, writing or editing? 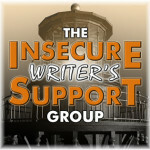 It’s the first Wednesday of the month and time for another Insecure Writers’ Support Group post. I don’t have a list of pet peeves when it comes to reading because I simply stop reading around the third chapter if I am not engaged in a story. My TBR pile is tall and life is short. Pet Peeve #1: Advice to authors to “just write”. Simplistic and condescending are my first reactions. Writing is a skill set as well as an art. Skill benefits from instruction. Practice is important, but it’s only one component. Pet Peeve #2: Blanket application of writing “rules”, especially “grammar rules”, particularly when done with a heavy hand. Writing is an art as well as a skill set. Learn the rules well, but art involves interpretation. Those who don’t know the difference should refer to Pet Peeve #1. Pet Peeve #3: Believing that your choices should be the choices of everyone. Learn to set aside your personal tastes in genre, construction etc. when editing or critiquing the work of someone else. If you can’t set them aside, then at the least make it clear upfront what your biases are. I am interested in your pet peeves. Please share them in the comments below. I’m not sure that writing is very good when it’s done just to have fulfilled a word count for the day. I do keep a list of pet peeves. I’ve always found it very easy to dwell on what irritates me. I need to work on that. 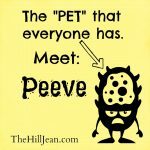 I agree – pet peeves are easy to compile. Then, the frustrations start tainting everything. #3 is really interesting. I’ve found myself having to actively work at this when I’m bet reading/critiquing for others. Just write? Easy to say. There has to be some sort of strucure or else it can turn into a load of gobbledygook!